Nothing screams summer fun more than strawberries! Though you can pick them up from your local grocery store, nothing tastes better than homegrown strawberries. Those who grow their own can definitely vouch for the better taste. Believe it or not, growing them is not as difficult as you think. Add young strawberry plants to your garden in late summer so you can harvest them next spring (check your zone). Straw keeps the fruit off the dirt! Don’t get discouraged if your first harvest isn’t fruitful (ha-ha! ), you’ll see more the following year. Two weeks before planting, add compost to your garden since strawberries require well-drained soil rich in organic matter. A few minutes before planting, soak your plants in shallow water to make sure the roots start strong. You want to set the strawberry plants 2 feet apart, in rows that are about 4 feet apart. Make the holes deep enough to cover the roots, leaving the crown above the soil. Once you plant the strawberries, water again. Finally, be sure to add straw around the plant, hence the name strawberries! The straw keeps the fruit from touching the soil so rotting is avoided. It also reduces weeds and keeps slugs at bay. If you don’t want to use the straw, you could always use landscape fabric. Water the plants one more time to keep the straw in place. 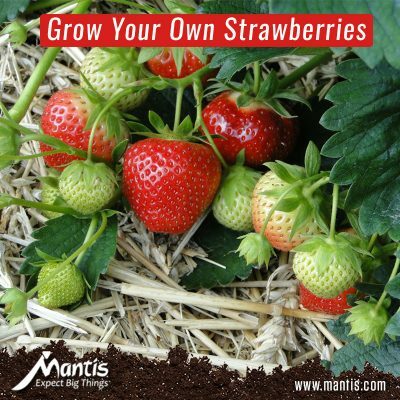 Strawberries grow long stems known as runners that should be trimmed early, so the plant focuses all its energy into producing fruits. Once the berries begin to develop, you’ll want to cover them with bird netting. Birds love ripe strawberries. Pro tip: grow new strawberry plants every season so you can always have “fresh” crops. Make sure your strawberries get plenty of nutrients and water, but do not over-water or over feed. You may have to replace the straws throughout the plant growth; be diligent with this as the straw keeps the slugs and weeds at bay! It’s best to pick strawberries in the morning when the berries are cool. Before you eat them, rinse them well then gently pat them dry with a paper towel. Store the berries in a sealed container lined with paper towels.